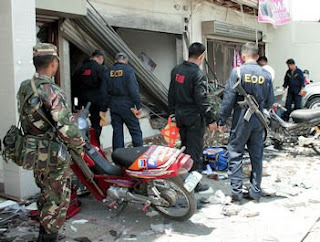 ZAMBOANGA CITY, Philippines - Mayor Celso Lobregat on Thursday called on local residents to stay calm and sober amidst the latest blast that rocked Zamboanga City, as he assured that the government is on top of the situation. 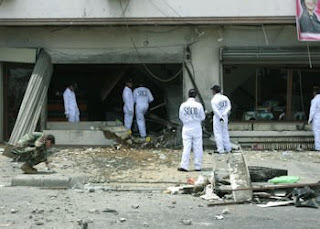 Two persons were killed and 21 others were injured when an improvised explosive devise went off at side of the Air Materiel Wing Savings Loan Association Inc. (AMWSLAI) building which houses the offices of the Alliance for Mindanao Off-grid Renewable Energy (AMORE) and the office of Zamboanga City Rep. Maria Isabelle Climaco. Lobregat said residents should continue with their normal lives and not be cowed by acts of terrorism. The mayor convened the City Peace and Order Council today with the presence of Defense Secretary Gilbert Teodoro and Armed Forces Chief of Staff Lt. Gen. Alexander Yano at City Hall. “We condemn this barbaric and criminal act. All of the victims are innocent civilians including children”, the mayor said in a press conference. He stressed that the military and police authorities in coordination with the local government unit are doing everything possible to ensure peace and security in Zamboanga City. Secretary Teodoro said President Arroyo, who was in Tawi-tawi when the incident happened has ordered military and police authorities to submit to her a complete report about the latest incident and to exert all efforts to avoid repetition of the incident. Gen. Yano said that the military through the Western Mindanao Command will come in to assist in whatever it can in the investigation even if the police is the lead agency in the probe. Yano and Teodoro were with the President in Tawi-tawi province and decided to go to Zamboanga on their way to Manila to meet with the Lobregat. Mayor Lobregat yesterday morning rushed to the blast scene upon learning of the incident yesterday morning. He was in Sinunuc attending the dedication of the Church of Transfiguration together with Climaco when the incident happened. Climaco’s office was also affected by the blast and two of members of her staff were slightly During the press con, Lobregat appealed to the media not to blow the incident out of proportion as the authorities are doing everything possible to neutralize the perpetrators. “This is an unfortunate incident. Please don’t blow this out of proportion”. The mayor said the city government will shoulder all hospital and medical expenses of the injured victims including the burial of those killed in the incident. After inspecting the blast site, Lobregat proceeded to the different hospitals to visit the victims.